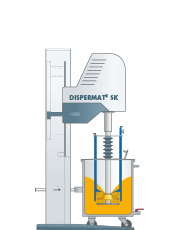 ​DISPERMAT® SC Dissolver ​ Multipurpose production dissolver for any container size. The SC production dissolver range is a multipurpose production dissolver for product quantities from 35–1800 l. As an option the dissolver can be supplied in a vacuum or explosion proof design according to ATEX. The production dissolver SC is designed for any container sizes up to 2.000 litres. The containers are fixed with a tension belt for safety. A central container clamping system is available upon request. 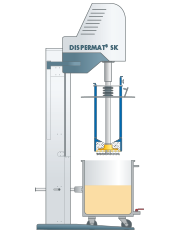 An integrated safety limit switch within the clamping device (according to the locking pressure) allows for operation of the dissolver, the dissolver can only be operated when the container is firmly clamped. The container with the liquid component is moved into position under the dissolver and the dissolver disc is lowered down into the liquid. The premixed product is dispersed with the dissolver disc. If the process is carried out correctly, the product will be put in a rolling, turbulence free movement. The dissolver`s most important application is the dispersion of fine solids into liquids. In this dispersion procedure three separate processes run in parallel. The wetting of the surface with the liquid medium. The mechanical de-agglomeration of the associated solid particles into discreet primary particles. The stabilisation of the smaller particles generated by dispersion against renewed agglomeration. 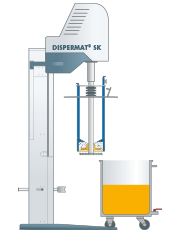 A basket mill is the solution for milling products that cannot be dispersed using a high speed disperser alone. Basket mills are highly flexible and efficient miling systens. The ability to clean quickly allows quick change between procucts. Motors from 15 to 55 kW. The container with the mill base is simply moved into position under the SK basket mill. The milling basket is lowered down into the liquid. The SK basket mill now starts the actual millling process for extremely fine grinding. 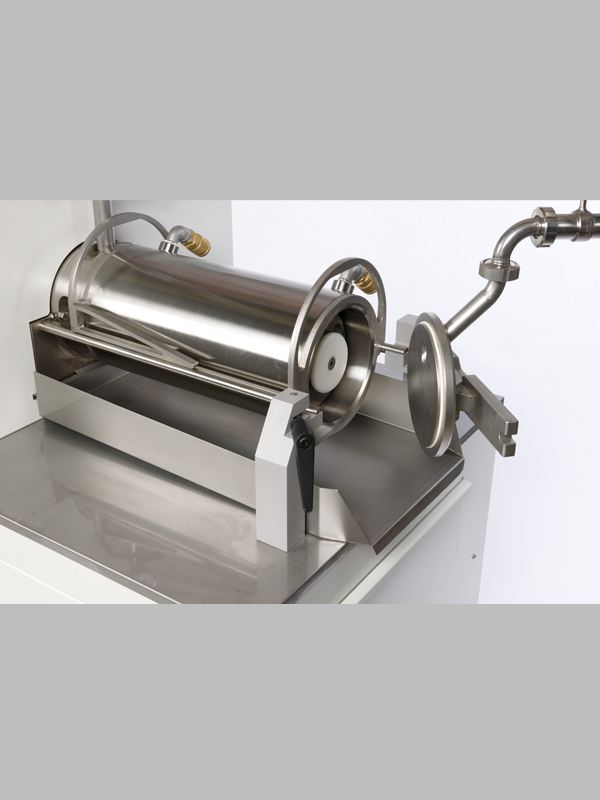 The double wall milling basket is cooled to remove any heat generated during the milling process. 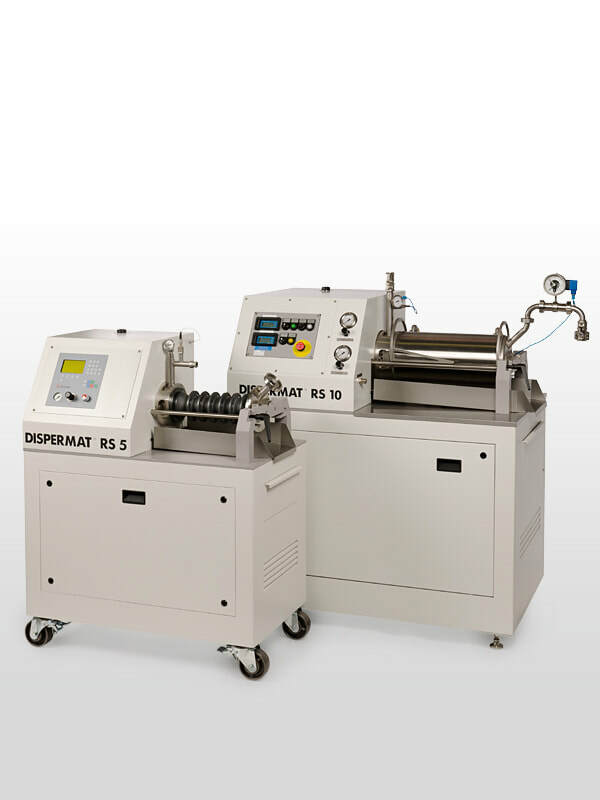 The DISPERMAT® RS is a horizontal production bead mill bead mill that is designed for fine milling and grinding with single pass and re-circulation. The RS bead mill can be operated for single pass milling as well as in the circulation process and provides outstanding grinding results. The RS horizontal mills have an efficient cooling circuit to dissipate the heat generated during the milling process including a cooled milling rotor. This allows heat sensitive products to be cooled and milled.